Scarlett’s check up turned out great. Her ANC is 2900 and all of her labs look good. She has been complaining of a sore tummy so that was our big concern today. We don’t know (again) if it’s attention seeking or real although it seems pretty consistent. It could be acid reflux which she has had since she was a baby or a left over effect of her cryptosporidium infection. I believe that the two infections were pretty rough on her entire GI system. We will try omeprazole for the next week and see if it improves. We have been spending the past few months adjusting to life again. It seems like every time we hit a new treatment phase, it is like starting a new chapter. We need to pause, evaluate and come up with a new plan. We are still in the “pause” phase, I think, and just taking one day at a time. I think that every new chapter is a shock to the system because there should be less to worry about. Should be. There are always wake up calls – fevers, sickness, new opportunities to think about, friends situations…our friend Emma’s relapse is really hitting us hard. It’s a scary thing to think about. In my mind I know it’s rare but my heart still aches. It doesn’t help when Evangeline tells me one night “I just don’t think I’ll be in this world very long”. What?!? Scare me to death child! Bottom line is, even when things are quiet, they are never really easy. Childhood cancer never really goes away. It’s always there. We have lots of friends needing prayers this month, too many to name. Please keep them all in your prayers. Thank you! It’s technically not one month since her last dose of chemo but Thursday was Scarlett’s first post-chemo appointment. She still has her “button” (port) so she was accessed for blood draw and to flush it. Her check up went quite well! She looks great! She’s been in physical therapy for a month now and enjoys doing her “exercises”. She is active and energetic. The only complaint we had was a rash that reappeared. It developed in October when she went off chemo for a few weeks. Dr. H told us that, as children detox from the chemo, the body’s allergic response hyperactivates and kids can develop rashes. That, on top of her sensitive skin, has created a perfect storm of itchy rashes and eczema over her entire body. Dr. B went over tips for reducing the itchiness and rashes (only 2-4 baths per week, lotion at least twice a day, stop washing hands – which goes against everything we have taught her). Her hands are the worst because she is a very good hand washer. But by washing so thoroughly, her hands are in danger of breaking open and introducing a blood infection. Scarlett’s ANC was a whopping 6000! Dr. B felt like she is on her way to being able to fight an infection on her own. We will do one last dose of IVIG next week and remove her port the following week! I feel like we only have two more steps until we have a sense of “closure” and port removal is one step. Dr. B went over the list of side effects that we need to be on the lookout for. He said it’s a day he loves and hates – celebrate being done with treatment but now listing all the new things to worry about. One day at a time I guess. We love Dr. B and his sense of humor, honesty and respect. One of the side effects is regression in cognitive function or learning disabilities. Dr. B said “well in Scarlett’s case, it will probably be going to Yale instead of Harvard”. Oh how he knows our dear girl! I hope that’s the only problem she ever has to worry about! Maintenance Day 604: Hip Hip Hooray! Our hospital doesn’t have a bell like a lot of other hospitals do. We loved watching Isaac last year ring his bell. So we decided to do it ourselves. Scarlett has been practicing for weeks. She always needed help finishing the saying but today she rocked it! Our celebration today brought together people that have been so supportive to us throughout this journey. Scarlett’s celebration was a celebration for them too. As I got ready this morning, I took time to thank God for my blessings. I broke down because I have so much to be grateful for. * For Scarlett’s doctors especially Dr. McHenry, Dr. Callahan, Dr. Brandt, Dr. Hill, Dr. Long, Terri and Kris. Without them, Scarlett wouldn’t be alive. * For Scarlett’s nurses who cared so deeply for her, physically and emotionally. * For Child Life who made her happy. * For Brian and Laura Gruender who introduced us to such wonderful and amazing families and made us feel at home. * For Julie and Nathan Stoffel and their entire family (especially Cole) who carried us for this past year. Giving us something to cheer for and look forward to helped us get through. * For Kim and Emma Paulsen who taught what it is to truly give. * For Jennie and Chris Schneider who were our first “cancer friends”. You have always been there to talk to, lean on, cry with, celebrate with. * for Anna Schultz who knew we would need financial help from day one. * For Suzanne Shandonay and Monica and Chuck Helmuth, family who held fundraisers for us. * For Ashley Shandonay who was always on call when I needed a running buddy or someone for a Snowdrop event. * For Michaele Oberbroeckling who sent packages and was always available for me to ask medical opinions. * For Brian and Jeanne Eickmeyer who offered us their home. * For David and Roberta Eickmeyer who were always there when we needed something or someone. * For Rachel Eickmeyer who brought childhood cancer to our former high school. * For Christi McElroy, Keri Ann Kelsey, Olivia Heiman, Megan Andrews who knew that we would need a bigger financial infusion and put together an amazing fundraiser. * For Megan and Debby Andrews who stayed with our kids and loved them as their own. * For Rose Heiman who was my sounding board and shoulder to cry on. * For Megan Haas who was always there for me. * For Peggy Tafelski, Rod and Lynda Tafelski who were always supportive. * For Scott and Mary Eickmeyer who were always a phone call away and have given everything for us. * For Matt Andrews and Julie Andrews who gave up part of their wedding day to raise money for Scarlett. * For Matt Andrews and Bill Bickel who made sure that Scarlett was financially set up for the future the day they found out. * For Mrs. Mazemke and Mrs. Thiel who gave Tate a second home at school during our most difficult year and who are now giving our girls that home. * For Tate and Evangeline who are the bravest, most understanding and caring kids I could have asked for. * For my husband who has been my rock, my strength, my other half. We could not have survived without each other. * And mostly, for Scarlett who is so brave! So smart! So understanding! So strong! For all of our challenges with her, we can’t imagine one day without her. We also remember all of our cancer friends. There are so many who have touched our hearts – Eli, Lilly, Harrison, Elysia, Daxton, Keegan, Bo, Jake – more than we can name. Some of them we have celebrated with, some we hope to celebrate with soon, and some who never got to ring that bell. Remembering them is what makes this day truly blessed. We get to celebrate. We get to see tomorrow and we are more than grateful for that! Thank the Lord for this day! Ring that bell to tell everyone! It’s time to celebrate- hip hip hooray! Today was Scarlett’s last dose of IV chemo and last lumbar puncture. When she was diagnosed, it seemed like this day would never come. I never wanted to think about it because I was too afraid. Two and a half years seemed like so long. We began the day delivering cookies. Seven dozen cookies was such a small gift to the people who had done so much. We gave orange and gold ribbon cookies. The valet staff, who were much appreciated on those cold days when nothing could warm her up and have always asked how she was doing. The pharmacy, who I of all people, appreciate so much. We never questioned her doses, never waited long for her meds, and they searched all over the state for Alinia during her last hospital stay (and even sent the extra doses home with us). The 10th floor…I can never say enough about the 10th floor. They have been so accommodating, so caring, so wonderful. Some have held us as we cried, brought special little treats (or a tiny little commode), fight each other over who gets to care for us, gave us comforting words, encouragement and silence when we needed it. They have listened to our worries, laughed with us, loved Scarlett, cried with us. They have become true friends. And the clinic staff…oh my gosh. We truly owe them everything. The nurses know everything that Scarlett wants – to open her band-aids, eat right after LP, use the orange wipes for deaccessing, hold Mama’s hand during LP. The Child Life department who has special toys set aside just for Scarlett’s LP, knows just what movie she wants to watch, that she wants an activity every time, and that she likes a lot of glitter. And the doctors. They literally gave her back her life. We have grown especially fond of Dr. B. He has respected us throughout the process – understanding our level of knowledge, deferring decisions to us, allowing Scarlett to be discharged early on multiple occasions, gave us his cell phone number and giving Brock “prescriptions” when we disagree on things (still not getting that falcon, babe). With help from great friends, we finished our list of backpacks. It has been a really fun project. Some of my favorites have been the little girl that loved My Little Pony and the little boy who liked Legos. But my favorite was the little boy who dreamed of going to the Packer Hall of Fame with his dad. We were able to give him a backpack full of Packers gear and two tickets to the Hall of Fame. I spoke with Amy today and she said that the kids just love them. They get so excited that, not only do they get something special but it is full of things just for them. One family refilled the backpack and brought it to their next appointment to give to someone else. That is exactly what we hoped would happen – to start a chain of love and giving. To finish that list was a great accomplishment but we aren’t done. We will continue to fill them as we can. Last night we told Scarlett that she would be getting her last butterfly today! She started crying. She didn’t want to get a butterfly at all. During the night, Brock found her on the stairs crying because she was afraid. The trauma of everything the past two plus years is hitting her now. She has also been bragging to her siblings that she isn’t going to feel her flu shot because she is going to get it while she has sleepy medicine. Unfortunately, the day didn’t go exactly as planned. Her access went pretty much as usual. She cries, more out of fear than pain I think. Then she starts a craft. Today, she had a big sign that said “Today is my last dose of chemo!” Her check up went well. We have another unknown skin issue to deal with. Hopefully that goes away in the next few days. Otherwise, we go to the pediatrician or dermatologist while we have her deductible met. Everything looked pretty good. However, we spent quite awhile discussing the IVIG that she has been getting. We can not know whether her IgG level is in range because she is making it herself or because the IVIG is raising it. Her doctors would possibly like to continue that through the winter. Which means that she will not get her port out yet. We decided to check her IgG level today to see what it was and then make a decision. Since IgG “cancels out” the flu shot, we would decide which of the two she would get. The lab called to tell Dr. H that the machine that measures the IgG had just broken and they would try to fix it. It still wasn’t fixed when we left the hospital so we gave her the flu shot. Unfortunately, by then, her sleepy medicine had worn off. All of that bragging and “nanananana”s backfired on her big time. We had planned and expected to have Scarlett’s port removed in about two weeks. We had told her that she would get her last butterfly today. We were wrong. We hope that at her next appointment, her IgG will be high enough to discontinue giving that. We hope that we can have her port removed before the end of the year so we can save a little money next year. We hope that her port can be removed as soon as possible so we can finally apply for Scarlett’s Make A Wish. We hope that her port can be removed so we don’t have to worry about fevers and line infections. We hope that we never have to deal with a port again. But today we celebrate. It is a day we have been looking forward to and praying for. Our little Scarlett is DONE with IV chemo and lumbar punctures! Welcome to the childhood cancer family. It is a family no one wants to be a part of, a family no one chooses. But we know your son. We know what he is experiencing, what he is feeling, and what medicines he is taking. We know that he will lose his hair, will throw up, will cry in pain. And we know that you will suffer. You will suffer the pain of watching your son suffer. You will experience the same feeling of helplessness, fear and loneliness that we do. You will be frustrated, angry and helpless when you find that your son is only worth 4%. You will spend moments crying into your pillow or out the window, only to turn around with a smile on your face so your son doesn’t see your tears. Your heart will explode with pure joy and pride when you watch your son fight a villain that he doesn’t see. There is no experience like watching your warrior and knowing that he is a part of you. We know all of this because we have been through it too. Childhood cancer knows no difference between socioeconomic status, race, nationality. Money can’t prevent it or take it away. Trust me, I think all childhood cancer parents would give every penny they had if it would bring us a cure. Knowing that you could have literally taken your son anywhere in the world and you chose treatment in the US makes me confident that our hospitals are the best. We are a family. I have never met you, I probably never will. But I know what you are experiencing. Our hearts are breaking for you, your wife and your children. It will be a long and difficult road but you are in no way alone. You have the rest of your new family. For we will be praying for you, picturing your son’s face when we discuss cancer, hope for your well being. My advice to you is this: lean on your wife. Let her lean on you. Cry together, talk together, share your feelings and emotions. But love each other. Soak up every moment with your son. Although it may be difficult to see his tiny little body, withering away, take pictures. Enjoy every moment – the good along with the bad. Those bad moments will determine who you are. Laugh. A lot. Every moment that you can. Even when she is crying, there will be a moment when you can make your wife laugh. Do it. Allow your son to make you laugh. It will make the days easier and the memories that much better. Spoil your other son. He may not remember this but it will shape him. Tell him he is important and that he is special. If you can, when you have an extra moment, contact another family. Read another story. Let someone inspire you. You are not alone. You have a new family to depend on and seek advice from. We are here to answer questions, inspire you and to listen. We are your cheerleaders. And we will rely on you. 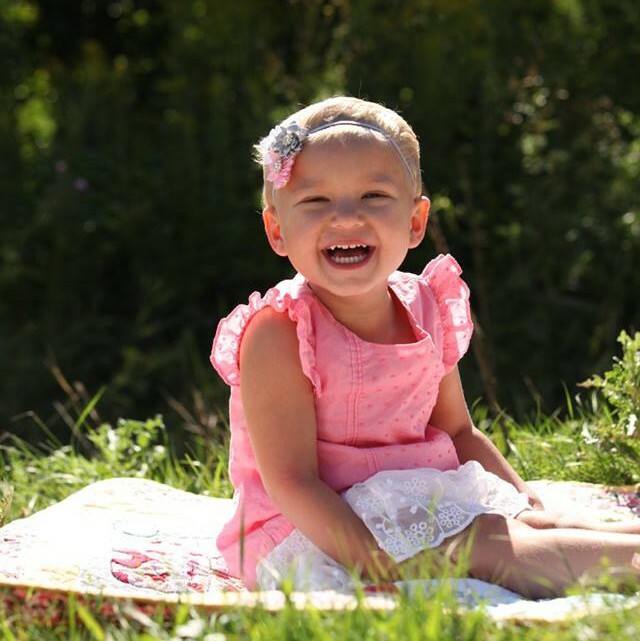 We hope that seeing childhood cancer firsthand will inspire you to be a voice for this family. Use your fame and celebrity to bring good things to children like yours. Use the anger and sadness from watching your son to push you to do great things. We believe in you! And when you are feeling defeated, as you inevitably will, remember that you have a new family to pick you back to keep going. Your son is going to need you. This week has been very fast moving. On Monday, Scarlett was doing very well. So well, in fact, that we tried to decrease her IV fluids and increase her oral intake. On Tuesday, we started planning for discharge! She improved so much so quickly. Tuesday her TPN went down to 50%, Wednesday down to 25% and today, nothing. This morning, her stool was tested for cryptosporidium and it was NEGATIVE! She will have one more day of her medication and she will be done! Hopefully, her diarrhea will resolve over the next week or two since she finished all of her other antibiotics tonight. At 6:00 tonight, our princess was discharged! She is now home and happy and playing with her sister. Tomorrow, Scarlett will have two more doses of Alinia. She will start a probiotic for a week. She has a note that she can go back to school but we will see how she feels when the time comes. It will take about a week to get her back on schedule, willing to sleep by herself, and eating normal food again. We also have to deal with the unknown questions. How will she do going potty by herself? Can she sleep through the night without going potty? Will she have accidents? What will her first “real poop” be like? 😬 Coming home is sometimes as exhausting as being in the hospital. In addition to that, we have her regular monthly appointment next week where will restart her chemo. It looks like she will get the IVIG at her last few appointments. The plan is to start her chemo at 25% of her previous dose. We don’t know how she will react to restarting the methotrexate. Please, God, don’t let her start with the diarrhea again! On Wednesday, Evangeline awoke very crabby. Right before I left for work, she told me that her head hurt and the only thing to help it was to go to sleep. After school, she still had a very bad headache, threw up in the car and fell asleep for three hours. So next week she has an appointment to discuss migraines. We seriously can’t win. But for tonight we count our blessings and count our three babies asleep in their beds under one roof. Life is good!